1v1 was established in 2015 by former professional footballer Richard Philp, to become the sports brand of choice for inspiring the younger generation. After having to retire early from the professional game due to ongoing Achilles Tendon injuries, Richard went on to become the founder of a childrens charity that used the power of sport to help and inspire the lives of vulnerable and disadvantaged children. Richard went on to launch the Prokick Schools Challenge a schools event that has gone on to inspire over 500,000 young kids. 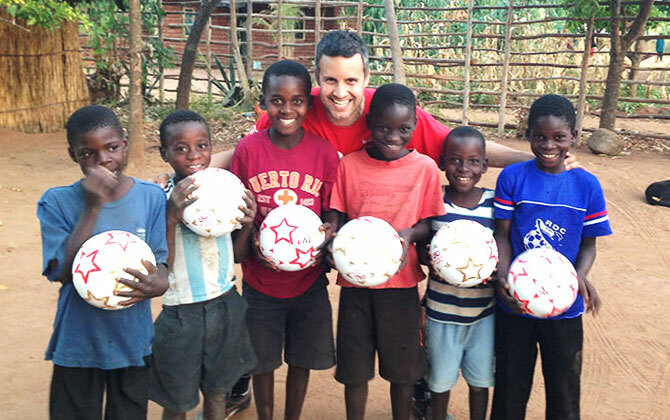 One of his proudest achievements was engaging and supporting the orphan children of Malawi. The creation of 1v1 enabled Richard to combine his enthusiasm for sport, and his drive to inspire the younger generation. 1v1 are proud to be the first sports brand to offer the ability to order personalised footballs in training and match series. You are able to choose the design style, the colours, the sizes and quantity you require. Every personalised football becomes fully customised to you and includes the team or school crest. 1v1 footballs can even be branded to include a business logo. 1v1 personalised footballs combine match quality with style! Customised for Football Clubs, Schools, Football Coaching and Charities. Branded for Businesses. We understand what makes a great football. 1v1 footballs is able to provide footballs to any design, any size, include the teams colours and most importantly have the team logo emblazoned on every football made. Our Pledge-a-Ball scheme is to enable teams of any level to have a tool to help generate additional revenue from local or national businesses. It can be used to generate sponsorship through the placement of the sponsors logo on every football. The benefits to every team and club is the potential to give them additional revenue, enhanced professional image, confident and valued players, and obviously reduction in number of footballs lost through mistaken identity. What started out as a simple day dream has subsequently turned into the first ever sports brand offering teams the ability to order any quantity of training and match quality footballs, in any size, any colours, but always emblazoned with the team logo. The vision for 1v1 is to create sports products that have an extended life. This means we want every 1v1 product to be passed on through our charity partners to disadvantaged children here in the UK and those living in poverty around the world.